Would Mass. residents lose health coverage under GOP plan? Yes. 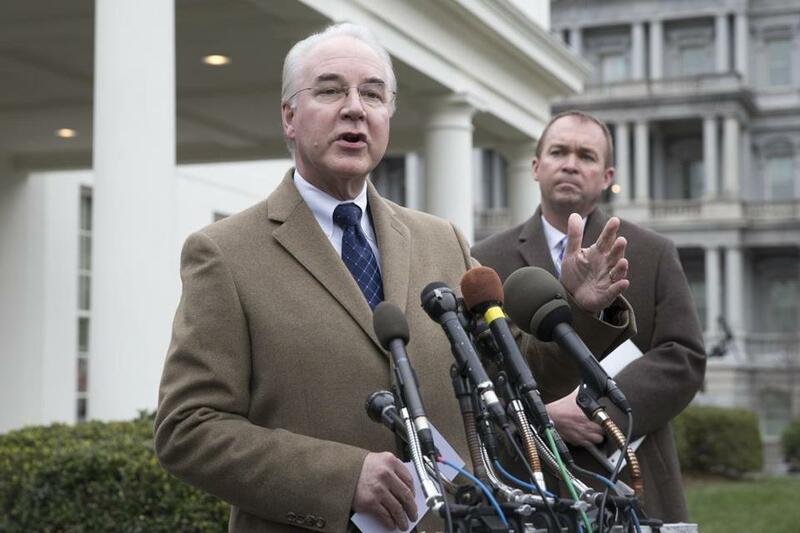 US Secretary of Health and Human Services Tom Price and Director of the Office of Management and Budget Mick Mulvaney spoke outside the White House on Monday. Some Massachusetts residents would lose health insurance if the GOP’s health care proposal goes into effect — but possibly not as quickly as the rest of the country. The Congressional Budget Office estimated Monday that 14 million people would drop off the rolls in 2018, and 24 million over the next decade. But most of the first reduction, in 2018, is attributed to the elimination of penalties for not getting insurance. The CBO projects that some people who had been buying insurance just to avoid the penalty will drop coverage once the penalty is gone. That may not be as big a factor in Massachusetts, because the state has its own law, with penalties, requiring that nearly everyone obtain health insurance. In later years, however, the state could take a big hit. Lower-income residents would be affected by smaller federal subsidies for private insurance and caps on Medicaid spending, both of which start in 2020. The subsidies that the state provides won’t make up for the loss of federal funding, and many people will not be able to afford health insurance. Nationwide, the Congressional Budget Office estimates that if the GOP proposal goes into effect, 24 million fewer people would have coverage in 2026 than if the current law continues. The Massachusetts advocacy group Health Care for All estimated that 300,000 people would be dropped from MassHealth, the state’s Medicaid program, based on the CBO estimate of a 17 percent loss of Medicaid enrollees. MassHealth enrolls 1.9 million people. “The CBO report provides more proof that the president’s health care proposal would be devastating for Massachusetts,” a statement from Health Care for All said. “It’s clear that Massachusetts will lose a substantial number of people,” said Brian Rosman, the group’s policy and government relations director. And the Republican proposal would thwart a new effort to refocus MassHealth on keeping people healthy, rather just paying for their care once they get sick, the advocacy group said. Gerard A. Vitti, chief executive of Healthcare Financial Inc., a Quincy company that helps people enroll in Medicaid, said the GOP plan would exact a particular toll from people with disabilities, including substance use and mental health disorders, who could lose Medicaid coverage. “The bleeding will be precipitous,” he said. “It will have a disproportionate effect on Massachusetts because we have more folks” on Medicaid.